There are two main ways to see the famous flowers. The easy way is Keukenhof Gardens, the more difficult way is the flower strip or Bloemen Route. Below I have broken down how to get to each of these and when are the best times to go. First some practical information: The tulips are in bloom from late march to early may. Check websites when planning your visit but peak time is usually the second to third week in April. Of course, due to weather this is different every year. 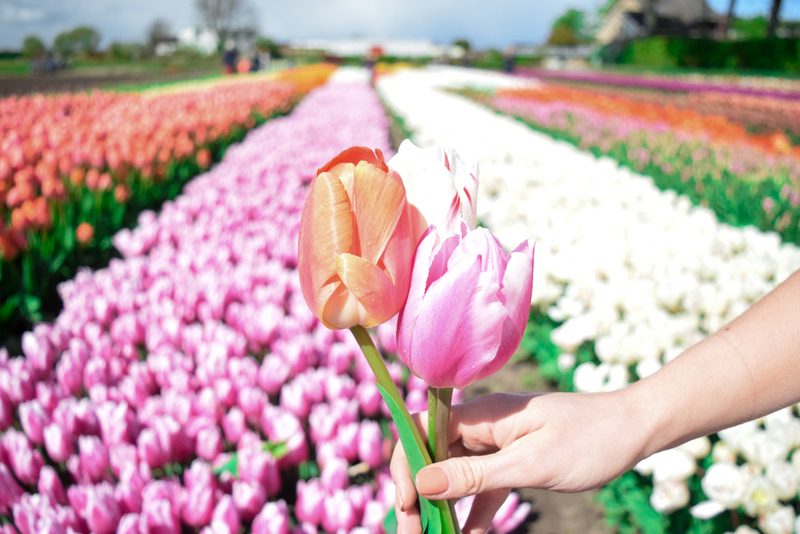 Visiting the tulip fields outside of Amsterdam is one of the main reasons millions visit Amsterdam every year. The other reason may be something that rhymes with meed...but that's a different article (read about the best coffeehouse in Amsterdam here). This means expect Keukenhof and even random tulip fields on the side of the road to be pretty busy. Visiting the tulips is not as easy as it seems since the tulip fields change every year and can also be heavily guarded. Don't be afraid to drive around and ask for help! Also, did you know that bacteria on your shoes can hurt and even kill delicate tulips? Not to mention all of the stomping around by endless girls who want the perfect Instagram photo. To be clear, I'm not making fun on anyone - I myself wanted that perfect Insta photo. But do be careful when visiting the fields. Don't walk on any private property and remember these are delicate flowers! What is the Keukenhof Gardens? A huge garden that was opened back in 1857, Keukenhof plants 7 million bulbs each year and welcomes over 800,000 visitors from across the globe. When is Keukenhof Gardens open? Keukenhof Garden is open from March 22nd 2018 till May 13 2018. The park is open from 8:00 AM till 7:30 PM. The ticket office is open from 8:00 AM till 6:00 PM. Click to view larger. Click here to book a tour of Keukenhof Gardens. Where is Keukenhof Gardens located? The gardens are located in the town of small town of Lisse, about 35 km from Amsterdam. Because it is so close to Amsterdam, and has many buses that conveniently run from Amsterdam's Centraal Station, Keukenhof is the easiest way to experience tulips in the Netherlands. Also remember that this makes it the busiest and most crowded way to experience the tulips. How do you get to Keukenhof Gardens? Like I stated above, there are buses that run from the main train station every hour. You can also arrange a tour that will pick you up at your hotel. How much is it to enter Keukenhof Gardens? Prices vary from year to year but are usually around $30. Bus ticket combos are available. See the Keukenhof Website for details. Can I take a guided tour to Keukenhof Gardens? Yes! I would suggest using this site to book a tour. I actually didn't visit Keukenhof on the recommendation from a nice receptionist at the Albus Hotel. (One of the many reasons I love them, read more about why it's my favorite hotel in Amsterdam here) She told me how crazy crowded it would be and a bit expensive. After talking with her for a bit about it I finally realized it just wasn't what I was looking for. If you don't mind crowds and a "garden" setting then I suggest going here. If you want a more quiet experience and true fields then do the Bloemen Route below! A popular route to drive (or bike if you get good weather) to see tons of flower fields and of course tulips. It is sometimes called the bollenstreek, blomen route or flower strip. Where is the Dutch flower strip located? The tulips stretch for 20 miles between Haarlem and Leiden. When is the best time to see the tulips and drive the route? The route is known for all types of flowers, not just tulips, so you can visit it 5 months out of the year. The earliest flowers begin to bloom in January. Late-blooming lilies can be seen till the end of May. The best time to visit the Bollenstreek is from mid-March to mid-May, which is the main season for the flowers. If you want to drive the route during prime tulip season then the best time to see tulips is mid-April. How do you visit the flower strip? Not far outside of Amsterdam is a gorgeous U-pick farm so you can take your own tulips home (or back to the hotel) with you! Each tulip is .20 cents making it a real bargain. This is also a great place to take some photos without disturbing the flowers. Whatever way you choose to see the gorgeous tulip fields remember this a bucket-list experience you won't soon forget.